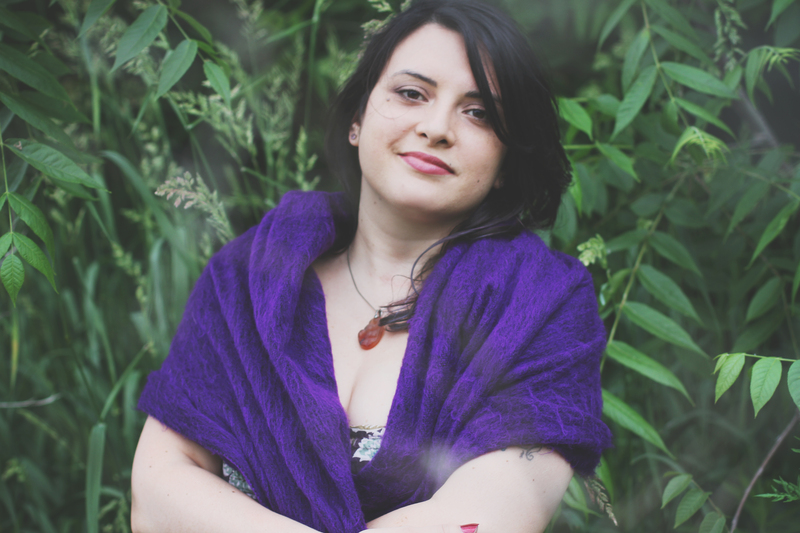 Now taking reservations for Upcoming Full Moon and New Moon Mala-thons! What’s a “Mala-thon”, you ask? 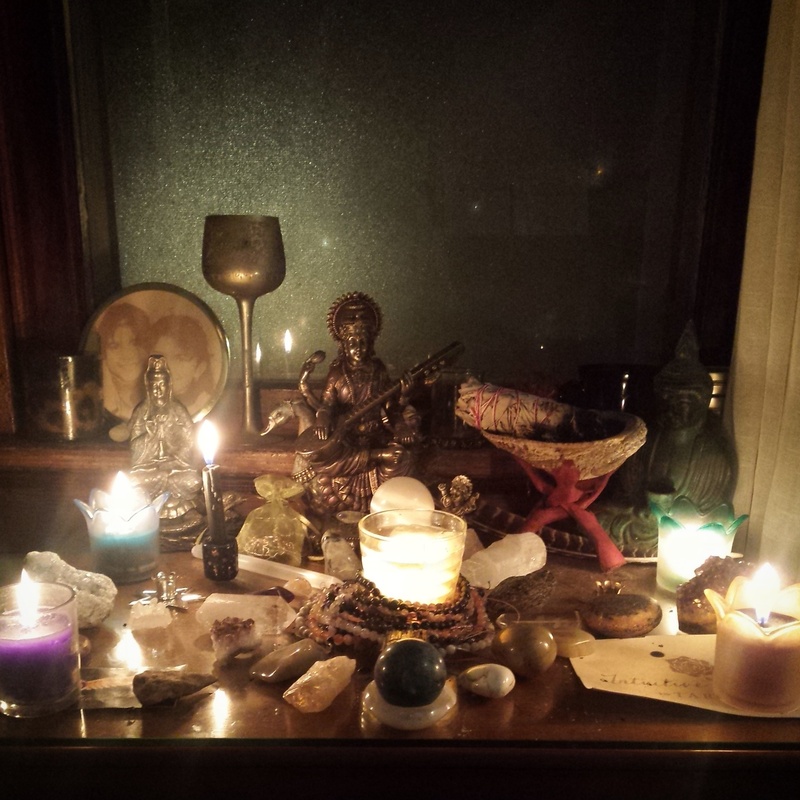 Under the energy of the Full (or New) Moon, I sit in my sacred space. I light reiki-infused, deliciously fragrant candles, burn incense and sage, and sip on moonblessed tea. I meditate, and call upon the assistance of Angels and Archangels, Ascended Masters such as Jesus, Buddha, Divine Mothers Mary and Kwan Yin, our loving ancestors, Mother Earth herself, and any other interpretations of the Divine Creative Energy that resonates with the intention we are trying to make manifest, that they may help us in the creation of these special spiritual tools, cleverly disguised as beautiful jewelry. I hold you and your intention in my heart, and make it my own. I visualize you acting according to your intention, and succeeding wildly. I fill that visualization with light and love and creative fire. Then I pour it into my work, through my hands. My research and intuition after our consultation guided me to the crystals and gemstones I’ll be using, according to their vibration and traditional healing associations. I placed them at my altar days (or weeks!) ago. I anoint the string with sacred oil. I focus your intention through my hands as I work, chanting a mantra with each stone strung, with each knot tied. About an hour and a half will pass, though it feels like suspended time. When the mala is done, both it and I are buzzing with energy! 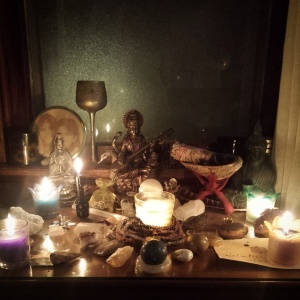 I lovingly place it back on the altar, to solidify the charge for another day or two before I send it to you, along with some suggested mantras for when you meditate with it. 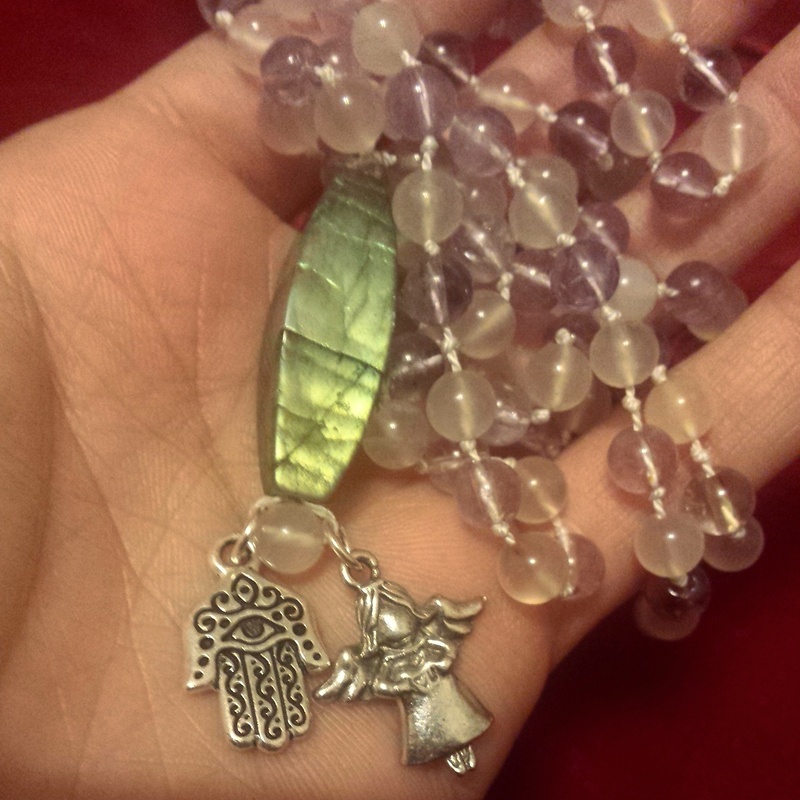 And then I make another mala. Or I wire wrap an amulet, if that’s more your style! Now tell me, what intention would you like to wear? What do you want me to make for you? Purchase your Skype or phone consultation ($20) by clicking the Paypal Button below! Your consultation fee is applied towards the price of the finished piece. During the initial consultation, we’ll talk about your intention for this special piece of wearable art. 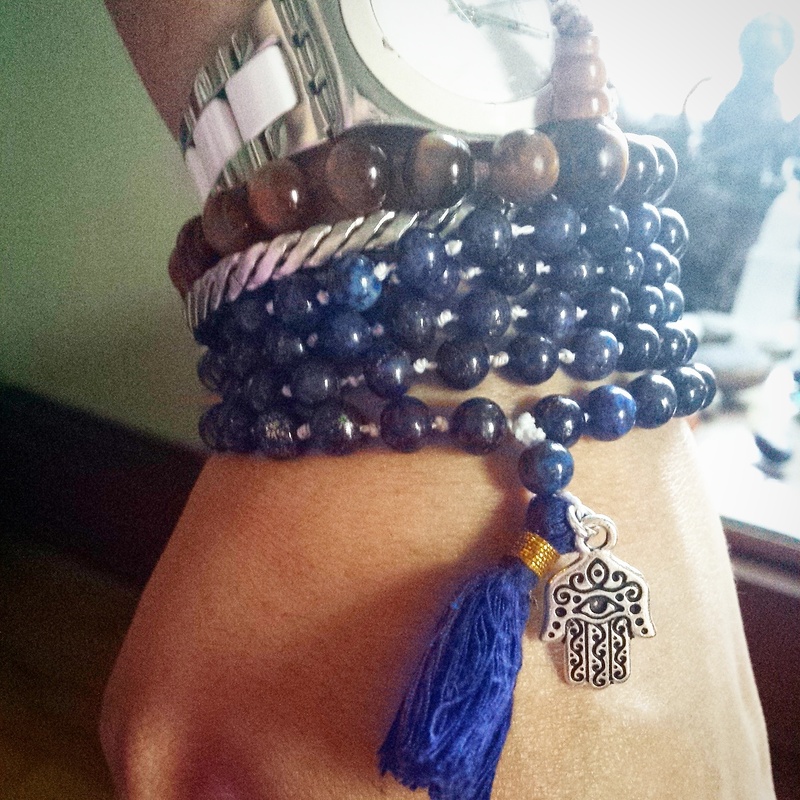 I’ll also get some details on your preferences (tassel or no tassel on your mala? silver or copper wire on your amulet? charms depicting an animal or special symbol?, etc), and probably also pull a few tarot cards to help us along. Within a few days I’ll send you some details on the crystals I feel would be most effective, and a quote for the final cost of the piece), as well as an estimated time of delivery. Due to the intense care, focus and time that goes into each piece, I’m able to offer only 3 or 4 pieces every month. Reserve your spot by purchasing your consultation today!